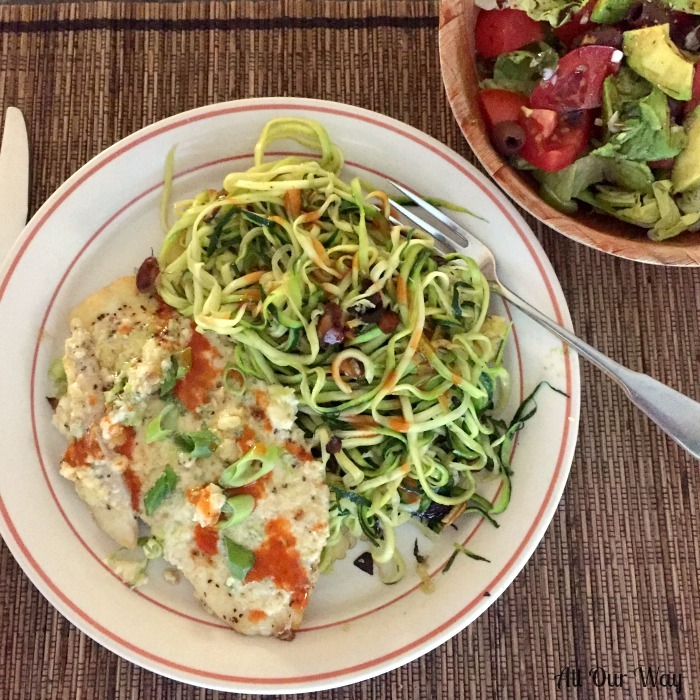 Zucchini Noodles Almond Sauté is so easy that I thought you might scoff at the two ingredient recipe. Yes! It only has two ingredients, zucchini, and sliced almonds, and the best part is that it takes less than 5 minutes to cook! Well, I’m here to tell you I was a bit skeptical myself. Deb from Smitten Kitchen swore that she could eat it morning, noon, and night. Nothing could be that good, I thought. But once I made it, tasted the results, I knew that I was in Deb’s camp and I had to share this fantastic recipe with you. The recipe cooks in less than 5 minutes. What’s important is to make the zucchini into noodles or 1/8-inch matchsticks. 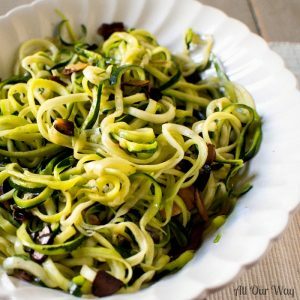 We used our hand-held spiralizer (very small and cheap) to make zucchini noodles or as some people call them zoodles. We also have a mandolin that would make thin strips but we wanted the zucchini to look more like pasta. If you use a mandolin, use the guard! Those blades are very, very sharp! Zucchini Noodles Sauté only takes one pan. Yes! If I can just use one pan, I will. The first thing you’ll do is add olive oil to coat the pan. No! You don’t have to measure. 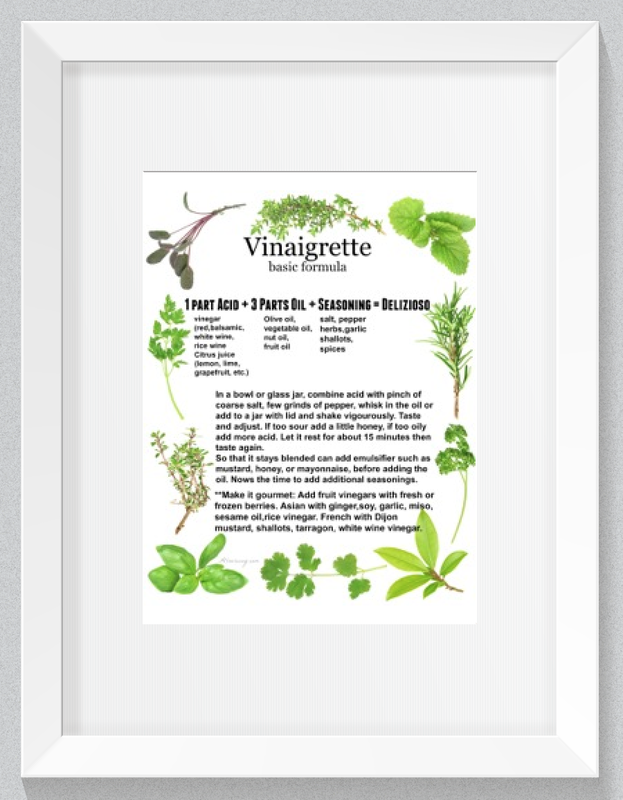 This recipe is so forgiving. It relies on directions versus amounts. Once the oil heats, that’s hot but not smoking, you add the almonds to the pan. The aroma will be incredible! Keep stirring them until they are golden-brown. It will only take 1 or 2 minutes. You don’t want to rush this step. The almonds will give the dish it’s amazing flavor. You do have to keep an eye on the nuts, so they don’t burn. Add the zucchini noodles and toss with the oil and almonds. Basically, you’re just heating the zucchini until they soften just a bit. This will take about 1 minute. Don’t overcook! Season with salt and pepper. Plate the zucchini and almonds then top with cheese, if desired. We used grated pecorino romano, but you may also use parmesan. Now, this is the best part — get your fork and taste. You’ll be pleasantly surprised at the complexity of flavor with just two ingredients. We served our zucchini noodle sauté with our Parmesan Topped Broiled Flounder. A quick and easy vegetable side that takes just two ingredients and less than 5 minutes to cook. The sliced almonds infuses a deep flavor to the oil then coats the zucchini noodles with that delicious taste. 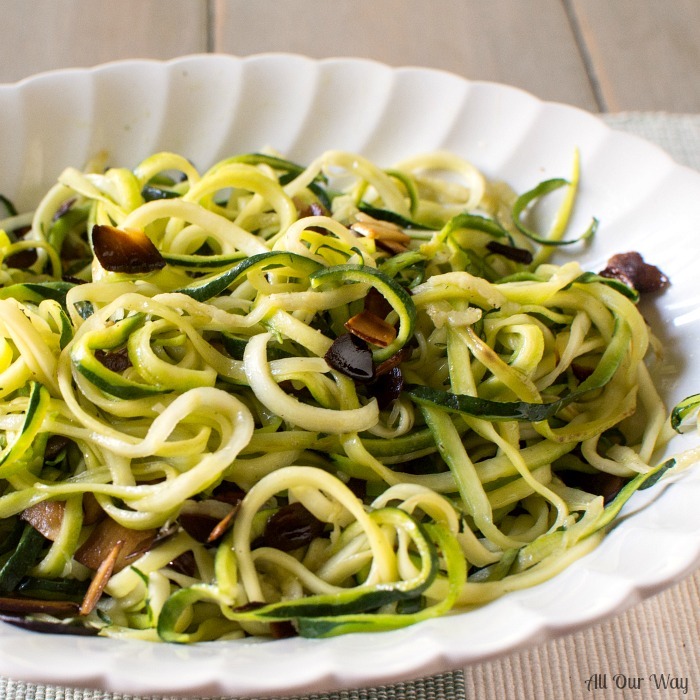 2 small zucchini made into noodles with spiralizer, or julienne into 1/8-inch matchsticks. Add enough olive oil to coat the pan and heat over medium-high until the oil is hot but not smoking. Add the almonds to the pan. Cook the almonds, stirring constantly until they are a golden-brown. About 1 to 2 minutes. Don't rush this step. The golden-brown almonds add the deep flavor to the dish. Add the zucchini to the pan. Toss the noodles with the oil and almonds about 1 minute. You don't want to cook the zucchini, just warm them until they soften. Season with salt and freshly ground pepper. Place on plate and top with cheese, if desired. Eat immediately. Sounds delicious! I love how simple this recipe is. Hi, Amanda! I was skeptical about the simplicity and taste. IT’S Amazing. I haven’t made zoodles in a while. But I think I’ll whip out my spiralizer gadget for this recipe. I love the addition of the pecorino romano. I think that makes the dish! Hi, Michelle! The pecorino does add that special element. Hope you give it a try. THANK YOU SO MUCH FOR SHARING THIS GREAT RECIPE ! I don’t eat carbs cause they make me gain weight, so this is just perfect and delish for me. Hi, Fabby!! You are so welcome! We’ve made it several times already and we’re simply in love with the recipe! Hugs right back!! I always look at your posts before lunch time and it makes me so hungry, luckily I’ve brought a good lunch with me today (an improvised panzanella salad!). Have a good day and thanks for your comment! Ciao, Jasmine! I’m so glad you signed up! I truly enjoy reading your adventures in Italy — some good, some bad! I just commented today on your recent post. Abbraccio! Wowza! It is hard to believe that a dish with only two ingredients could be that good – but I am believing you!! I’m going to have to pull the spiralizer out today! I’ve been needing to do that! Thanks for sharing! Have a great day, my friend! I was amazed too, Annie! I mean really, two ingredients and it tastes good! If you make it let me know what you think. Un abbraccio! I have that little gadget but never got the hang of it. I want to give it another go using this recipe. Looks good! Will try this soon! I have to look for that gadget, seems so nice and perfect for zucchini, grazie Marisa, un abbraccio ! Ciao, Chiara! The hand-held spiralizer is really nice. It doesn’t take up a lot of room in the kitchen drawer. I got mine through Amazon. Buona giornata! Un abbraccio! Wouldn’t laugh at all. Looks like a wonderful recipe and I bet it is very tasty. Don’t have the gadget, though, so I would have to grate the zucchini. Perfect side for fish. Hi, Jovina! This little gadget is super cheap — we got it when we were traveling. Your mandolin would work or just slice them into little sticks. Let me know how you like the recipe.